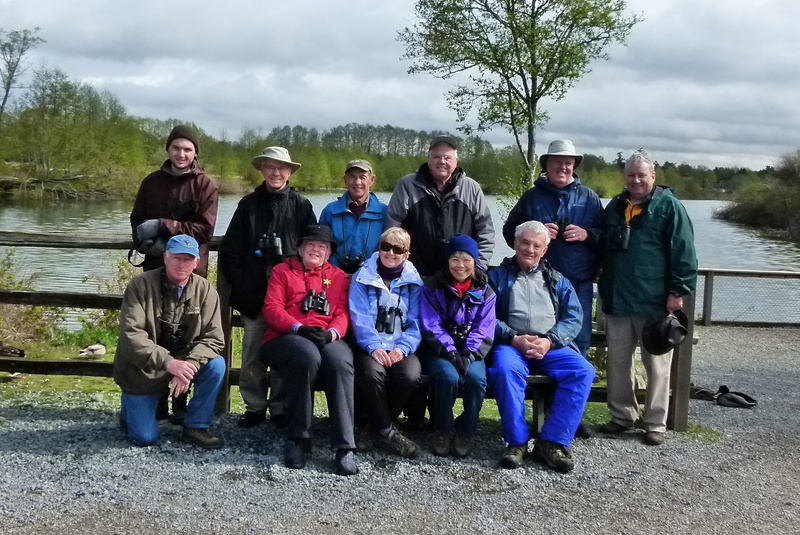 Twelve birders (Roger M, Mike B, Johnny McF, Anne M, Peggy K, Sleepy Gerhard, Hans-Ulf, Eric L. and his friend Forrest R. Gump, New Brunswick Lyle, Kay G and me) enjoyed an erratic but abundant day at the Tsawwassen Ferry Port, on the drive to Westham Island and then at Reifel Bird Sanctuary. Hi-lites were: Black Turnstones, Black Oystercatchers, dancing Western Grebes, posing Barn Owl, FOY (First-of-Year) Yellow-rumped and Common Yellowthroat Warblers, beaut Ring-necked and Wood Ducks, three White-fronted Geese, and thousands of Snow Geese preparing to and flying north. Check out Eric’s and others’ photos (soon) on our DNCB Picasa site at http://picasaweb.google.com/dncbirding or on our Blog at www.dncb.wordpress.com. I apologize for the long drivel below; the delete button is easy to hit. It was cold and pouring rain when our three car convoy left Petra’s at 8:00 a.m. toward the pull-out along the highway just before the toll booths at the Tsawwassen Ferry Port. The stop was worth it as the well-camouflaged Black Turnstones (30+) were foraging along the rocky shore just below us. Pairs of Black Oystercatchers were dropping in for photo ops before taking off to other spots around the jetty. Not a lot of birds in the Bay like there normally is, but we saw several rafts of Brant Geese, Greater Scaups, Surf Scoters (White-winged in the distance) and a few remaining Buffleheads. Common Loons and Horned Grebes also around. As for Shorebirds, a few Lesser Yellowlegs were foraging on the Spit and one Sanderling flew by, but others were likely foraging on the other side of the Spit, which we couldn’t see. Several adult and immature Bald Eagles often scaring-up the rafts of ducks. Following a couple of hiccups by our directionally-challenged drivers, the convoy met again on the Tsawwassen First Nations Reserve after a quick glance at the active and growing Great Blue Heronry at Tsa Tsu Shores. Not much on the TFN, but the weather improved and became sunny and warm. On our way to Westham Island we stopped along 33A Avenue when Eric spotted a Northern Harrier rousting a Merlin. A huge flock of Snow Geese was foraging very close to the overpass entering the Container/Coal Port. Occasionally groups of hundreds would take off and head north in large V’s. Roger “wet himself” at seeing a small flock of brilliant House Finches in the bushes, while others liked the Savannah Sparrows and colourful American Goldfinches. We stopped at our regular spot beside the Fraser River near Canoe Pass. Actually, this is where we saw the Lesser Yellowlegs, but I don’t feel like revising what I wrote above. We also saw some Dunlin, in breeding plumage with their black bellies. Occasional swarms of other Shorebirds in the distance, probably Sanderling and/or Western Sandpipers. A pair of Mute Swans looked as if they were nesting at the back door of one of the Float Homes. At least 8 Western Grebes in the channel and we all got “excited” (except Roger who was finished) when a pair started doing their mating ritual in unison in front of us. We stopped at my friend’s farm on Westham Island to check for Barn Owls. Eric got some great shots of one posing in the rafters, while several others (birders not owls) slept through an “intellectual” discussion/dissertation on beans, potatoes and anti-dumping legislation. Lots of Violet-green and Tree Swallows flying around and I saw a Barn Swallow. At Reifel, others saw Rough-winged and Bank Swallows, but we didn’t. On the road into Reifel were lots of Northern Shovelers in the adjacent slough, one male was weirdly purple coloured (don’t know why). At the Reifel entrance the four interloping (as opposed to the resident family of three) Sandhill Cranes welcomed us along with the always affable Staff of Varri, Kathleen and Laura. Kathleen took our obligatory Group Photo before our almost-understandable ornithologist, Gerhard, had his nap on a park bench. We had a very productive hour-plus walk in the Sanctuary, as usual seeing many “bird candy” species up-close-and-personal. The Black-crowned Night Herons were in their tree, lots of breeding plumage Sparrows (White- and Orange-crowned, Fox, Song) on the paths, Ruby-crowned Kinglets and beautiful male and not-so-beautiful female Yellow-rumped Warblers in the trees. Anne heard a FOY Common Yellowthroat, which others saw, but not me. The three “regularly-seen” White-fronted Geese gave us a nice fly-past. As for waterfowl, pairs of gorgeous Wood Ducks were everywhere, including high in the trees. A Ring-necked Duck pair was next to a couple of Lesser Scaup pairs for neat comparison. Green-winged Teal, Northern Pintail, Gadwall, American Wigeon and Mallards around, but we did not see a Cinnamon Teal or a Canvasback. Noisy Marsh Wrens were building lots of nests and Rufous Hummingbirds often buzzed by us. We loaded a still-drowsy Gerhard into the vehicle and on the road out of Reifel, a Red-tailed Hawk posed on a pole near the Alaksen entrance. Another awesome morning of birding, despite the lack of “edible goodies”. Last Sunday, April 15, Delta Nats Joyce, Jennifer, Eleanor, Ursula and Terry McComas had a ball “manning” our Display Booth at Delta Corp.’s Fish release event at Watershed Park. An estimated 700 people attended this event. A dozen or so adults and children joined me on the pre-event Bird Walk through the park to the Fish Release area at the artesian wells. Not many sightings, except for a Downy Woodpecker entertaining us and a fly-over of two Sandhill Cranes. I am awaiting Ken’s photos, including a Group Photo taken at the Meadow overlook of the Bay and his shots of our Nats Booth. Our Display is currently set up at Delta Municipal Hall for Earth Week; tonight (Thursday) the people come between 4:00 and 7:00 p.m. We will set up the Display again this Sunday, April 22, from 1:30 to 3:00 p.m. at the entrance to the Burns Bog walkway in conjunction with the Burns Bog Pilgrimage. We/Terry Carr are constantly seeking volunteers to “(wo)man” our display at events like these. I will be at Petra’s next Wednesday morning, April 25, for departure on another DNCB Spring birding outing “somewhere around the Bay”, destination to be determined. Again, comments encouraged, and let me know if you are exhausted and want off my List. This entry was posted in *DNCB, Barn Owl, Fish Release, Reifel, TFN, Tsawwassen Ferry Port, Watershed Park, Westham Island. Bookmark the permalink.